I searched the archives for Rumania or Roumania – the name was incorporated back in 1862, when Moldavia and Wallachia became the Romanian United Principalities. In the summer of 1918, the war was still raging on. Canadians were ‘fighting the hun’ on the Western front alongside the Entente Powers. Dispatches from the Eastern Front still made their way in the two national journals published in Toronto: The Globe and Toronto Daily Star. Some of them mentioned my native country, which was half occupied by the Germans and at the time subject to a disastrous peace treaty signed in the spring of 1918. To his credit, King Ferdinand (who moved his government to Iasi, away from the occupied Bucharest) resisted formalizing the document by not adding his signature, which enabled him next November to resume his military actions against the Central Powers. 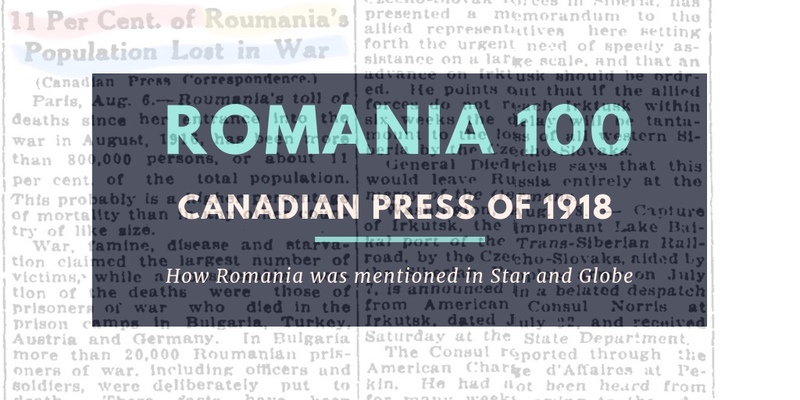 Posted in English blog and tagged as featured, Romania, roumania, rumania, the globe, toronto star, world war 1.